eine Symphonie des Grauens or Nosferatu: A Symphony of Horror. A silent film released in Germany in March 1922. Although Schreck’s name is mostly forgotten to all but perhaps a few vintage horror film enthusiasts and silent film historians, Schreck’s portrayal of the cadaverous vampire still influences film making today. In fact it can be argued that all modern day Vampire movies trace their origins back to this silent classic. Today what maybe lost on a modern audience is the film is in fact an expression of the German experience in the Great War and the aftermath. 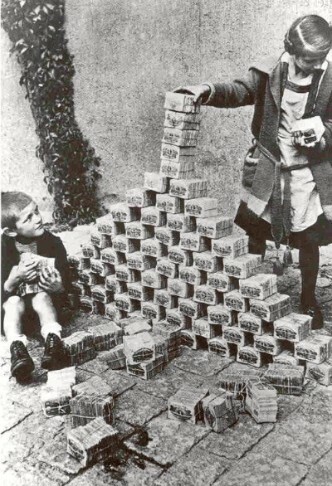 Children play with worthless German currency. The collapse of the German Imperial forces and the subsequent armistice in November of 1918 threw Germany into a condition of turmoil. The treaty of Versailles punished Germany with crippling debt, which pushed the German economy into free fall. By 1921 Germany was experiencing hyper inflation making the German currency virtually worthless. The treaty also forced dismemberment upon Germany. 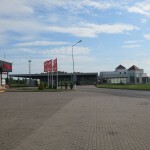 The vanquished Germans gave up much of their eastern lands, of Prussia, Pomerania, Silesia and Memel to the newly created countries of Poland and Lithuania. 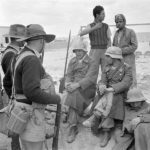 Thousands of Germans were uprooted from the only homes they had known and forced to leave the lands their families had lived on for in some cases centuries. 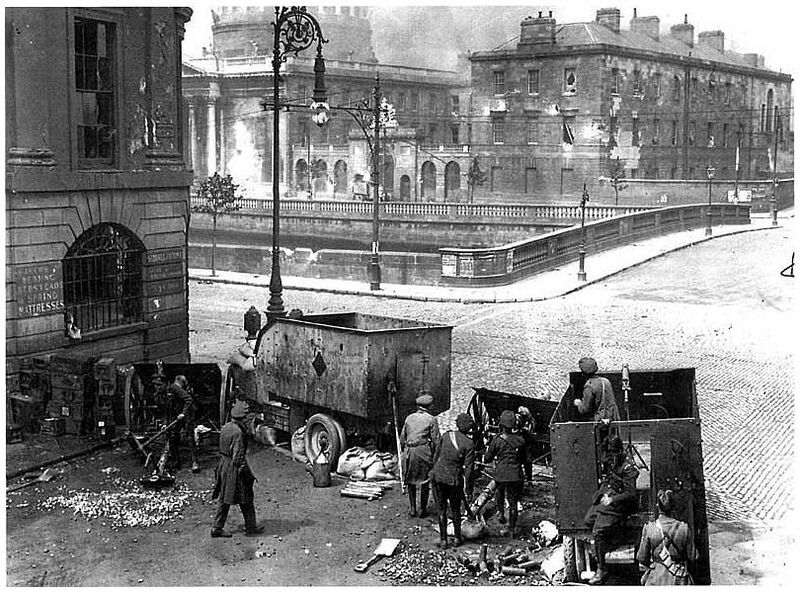 Vicious urban warfare had also broken out across the streets of German cities between roving bands of communist thugs and para-military members of the Freikorps both attempting to assert their control of a crumbling Germany. The German people had been thoroughly crush. 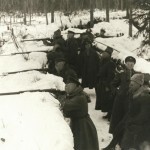 Any semblances of normalcy that they had experience prior to 1914 were gone for good. Many had lost their lands, their homes, savings not to mention family members to the war. It is clear that many Germans from this era lived in a constant state of instability. Many became bitter and angry as they saw what they once had taken from them. It was under these harrowing conditions that the film Nosferatu was produced. The idea for making Vampire film saw it genesis in the war-time experience of producer Albin Grau. 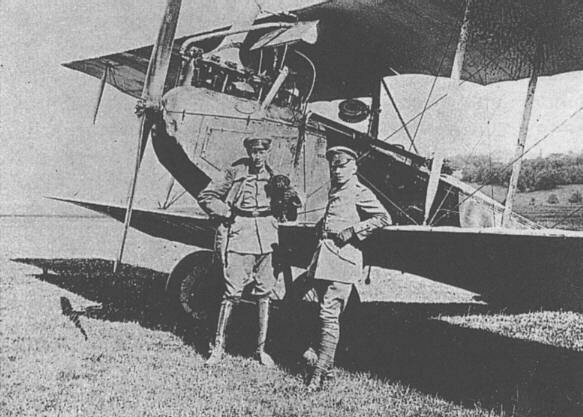 Grau, served in the German army during the Great War on the Serbian front. While in Serbia Grau encountered a local farmer who told him of his father who the farmer believed had become an undead vampire. After the war Grau set about producing a film about a vampire that would become Nosferatu. Grau turned to film director Friedrich Wilhelm Plumpe, also known as F. W. Murnau to direct his monster movie. The film’s plot bears a lot of similarities to the Bram Stoker novel, Dracula. The story revolves around a German agent named Hutter who is sent by his employer to Transylvania to arrange the purchase of a German home by one, Count Orlok. Orlok is of course the monster, Nosferatu who is simply moving to Germany to seek new victims. This plot does in fact follow so closely to the Bram Stoker novel that Stoker’s window sued over the film and a judge ruled in her favor. There are some key differences though. Unlike Dracula, who’s bite transforms the victim into a Vampire, Orlok simply kill’s his victims to feast on their blood. In the film the deaths resulting from Orlok’s feedings in his new German home are blamed on the plague by the towns people. Like Dracula, Orlok spends his day sleeping, arising at night to hunt for victims, but unlike Dracula, who is weakened by sunlight, Orlok is killed by it. 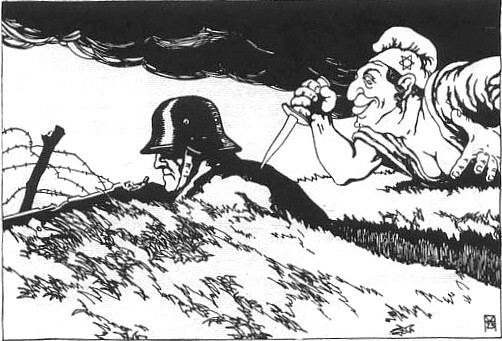 While there is no direct evidence that Gau choose to produce a horror movie because of his experience in WWI, there is no doubt that the war influenced aspects of the film. Both Grau and the director F. W. Murnau saw considerable action in WWI. Murnau not only saw action as a company commander in the muddy trenches of the Eastern Front, but would later see service in the air after he transferred to the German air service. He survived at least eight crashes. The warfare experience by the men who served in the Great War could be extremely vicious. Combat often times was close and personal. 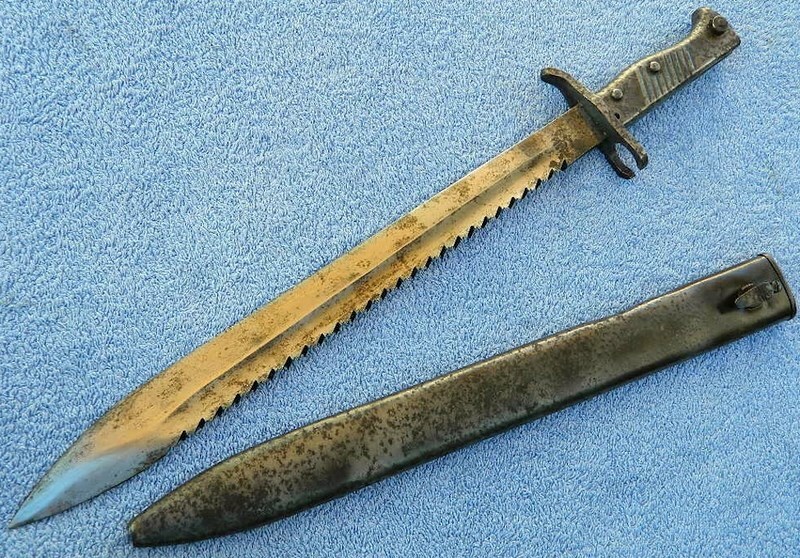 Men fought one another with bayonets, clubs, sharpened entrenching tools and other seemingly medieval weapons. More then few WWI veterans would recall severing the head of an enemy with a sharpened shovel. 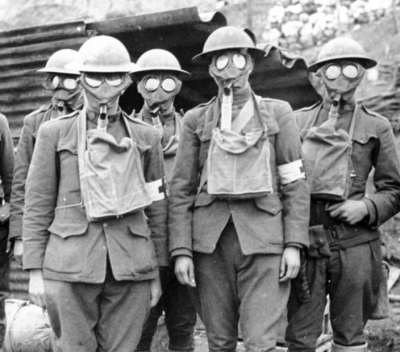 Poison gas was also used, forcing the combatants to don gasmasks, which could give the wearer an almost inhuman appearance. As soldier’s rushed into no man’s land to stop enemy attacks it may have seemed to some that they were clashing with monsters who would appear out of nowhere in the thick smoke. Nosferatu uses the fog to stalk his victims. This would not have been lost on those who had experience combat in the Great War. 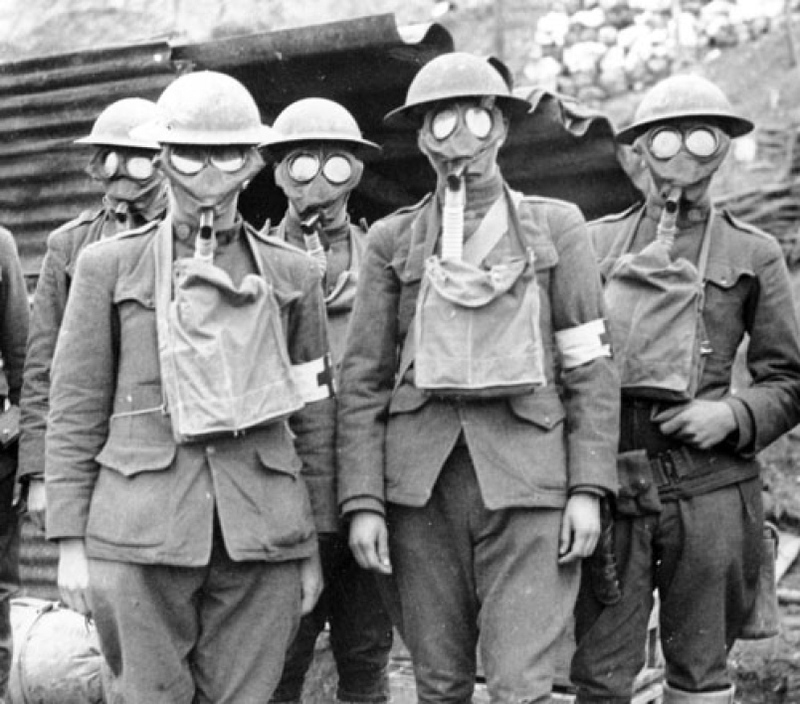 Any WWI veteran watching Nosferatu would have been aware of what dangers can lurk in the smoke and fog. Another horror which Great War combatant were forced to endure were vicious rats. 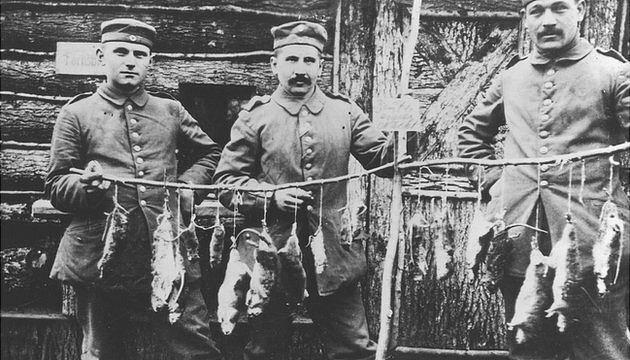 Veterans of the great war often talked about the constant appearance of rats. The rats were more than just an uncomfortable nuisance. Aside from being the bearers of various diseases there was an unsavory darker element to the presence of the rats. 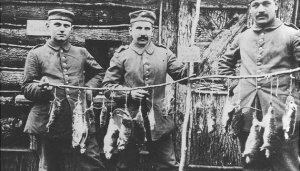 The rats feasted and grew fat on the unburied dead that littered the battlefields of the great war. Soldiers knew this and many spoke in the post-war era of being revolted by the appearance of these vermin. There is a scene in Nosferatu where a coffin is opened and hundred of large rats pours from it. Certainly F. W. Murnau having experience trench warfare would have been aware of the revulsion this scene would have drawn on any veteran of the Great War. Even the appearance of the monster himself may have had its roots in the Great War. While in the film Dracula, the vampire is portrayed as a handsome, well spoken aristocrat. Orlok is not. He is portrayed as a shrunken, cadaverous fiend. The dead of the Great War often times went unburied for long periods of time. 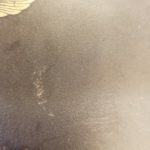 Even when buried the corpses sometimes rose to the surface due to the rain, and shelling which heaped up large quantities of earth and mud exposing the decaying corpses. Many a soldier recalled rolling into a shell hole and coming face to face with a rotting corpse. The creators of Nosferatu would have seen corpses like that, perhaps even had the experience of coming into contact with a grotesque corpse. These experiences would have helped create the terrifying monster that was Nosferatu. Some thought should be given to Max Schreck who portrayed the Vampire. 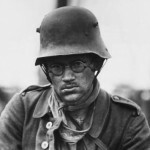 Schreck also served in the trenches of the Great War with the German army. Little is known of his war-time experience but there are some signs he may have dealt with some form of post-traumatic stress disorder. Colleagues commented that he preferred to keep to himself. He was known to take long walks in the forest by himself, often times disappearing for hours at a time. He once stated that he lived in a “a remote and incorporeal world” Many of the men who service in the Great War not only experience terrible things, but often did terrible things to stay alive. Schreck may have secluded himself to his “incorporeal world” to deal with his wartime experience. 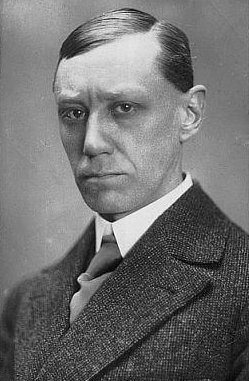 Many critics have stated that Schreck’s performance as the vampire was so good, that he may have been a real vampire. This is of course nonsense, but it maybe that he drew on the horrors of the Great War to create the terrible monster. As already has been discussed during the time that Nosferatu was produced and released, Germany was experiencing turmoil. Film historian have often discussed that the Vampire is a symbol for things far worse then a marauding fiend. Nosferatu is a foreigner. He is an outsider from the east, who comes to Germany to pray upon the helpless German people. 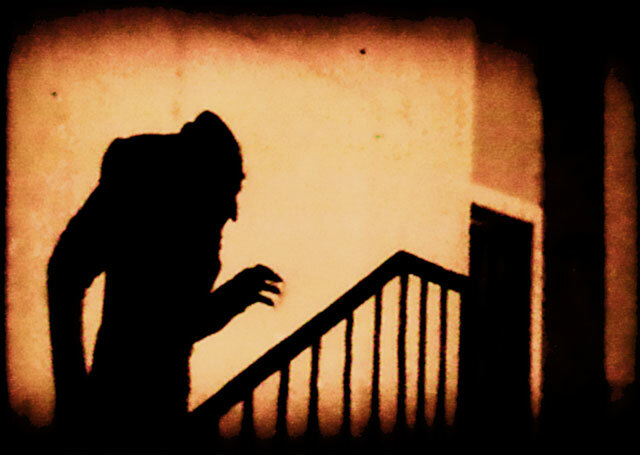 Some have claimed that Nosferatu may symbolize the Jews, pointing to the creature’s hooked nose being part of the Jewish stereo type of the era. While anti-Semitism did exist in Germany in the early 1920s, this seems unlikely. The stabbed in the back myth that blamed the Jews for the loss of the Great War was only in it’s infancy, and did not gain much traction until mid 1922, after the films release. The extreme anti-Semitism Germany would experience did not manifest itself to later in the 1920s. At the time the war’s loss was mostly blamed on the Berlin government and it’s civilian population. What maybe more likely is that the Vampire represents any of the foreign elements seeking to drain Germany of it’s life, and cripple it. Nosferatu may represent the Allies, who sought to drain Germany of it’s cash reserves by forcing it to pay crippling war debt. He may also represent communists who were supported by foreign element who wished take over Germany. Still to others especially Germans from the East the monster maybe those who sheared away German territory and gave it to others, just as Nosferatu sucked his victims of their life blood. Still other may have seen the monster as the Kaiser himself who brought Germany to its knee’s by waging the Great War. 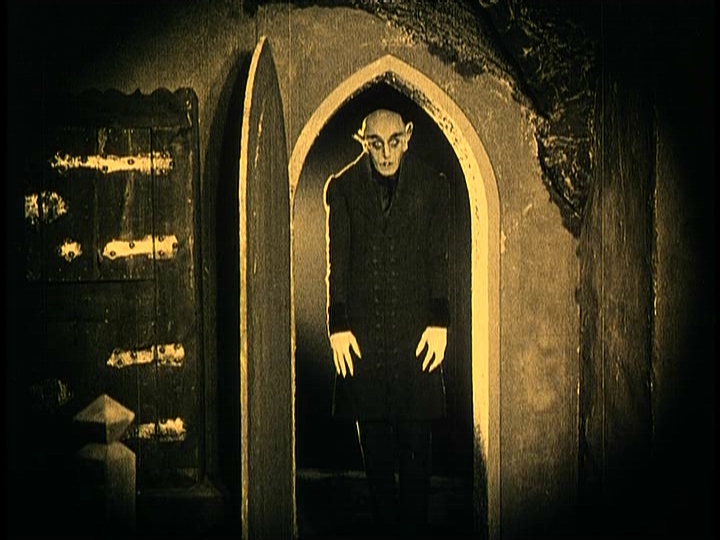 In truth who Nosferatu is may have simply depended on one’s perspective on the political situation of the 1920s. Still the symbolism would not have been lost on a 1920s German audience. 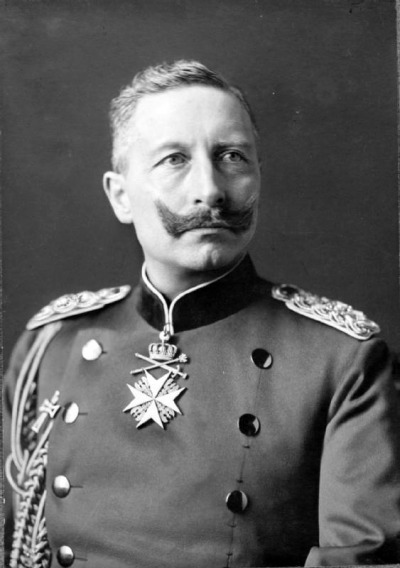 Kaiser William II, inspiration for the monster? All films, no matter what their genre are a reflection of the era in which they are produced. Certainly Nosferatu is no different. The turmoil of 1920s Germany and the war-time experiences of those who produced the film left their marks on the production. Would there have been a Nosferatu without WWI? It is hard to say for certain. Even still would the film have been as terrifying? Would have it been the same? With the tragedy that was Germany in 1922, the finally of Nosferatu seemed to prophecy that better days were ahead for Germany. In the final scene the fiend leans over a beautiful sleeping women. He greedily proceeds to feast on her blood, not realizing in his lust that the sun is raising. As sun rays enter the women’s chamber the monster suddenly realizes the danger he is in, but it is too late. Nosferatu disintegrates in a puff of smoke. Were the film makers trying to say Germany’s enemies would be vanquished? Was the beautiful German women’s sacrifice a symbol of what German had lost in the Great War? Whatever the meaning may have been, Germany’s torment would continued for two more decades. In truth Nosferatu was just a fictional monster. Germany would soon have much worse things to worry about in the form of Nazism and another crushing World War.